A few weeks ago, I flew the coop yet again at work to celebrate "The Ukrainian"'s birthday. This is not the first birthday of his that we've spent together, but this is the first time I have been able to plan something for him. That morning, I told him that he could not come downstairs from his shower until I told him he could. 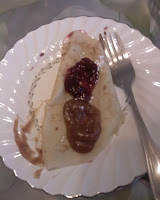 Downstairs, I was quickly churning away these crepes, hoping to make a breakfast light enough so that we could eat at our ultimate destination. 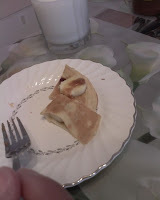 This was my first time making these, and they were surprisingly easy and very much tasted like intended. Unfortunately, I completely forgot to take a picture of the setup I had once I called him down (it was more presentable than these pics below), but we managed to get these shots later as we were eating them. 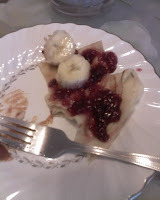 Above: Crepes w/banana, powdered sugar, apple butter, raspberry preserves. I later saw him put syrup and cream cheese on his. Shortly thereafter, I gave him his gift (rice cooker), which he like(d/s) and went to the bank and get gas. He usually drives when we go out, so I was only giving him directions to our next destination. It wasn't until we were off the freeway that he asked, "Are we going to the Huntington Library?" The Huntington is a botanical garden with several museum-type buildings inside. We basically spent the whole afternoon there looking at everything, enduring the heat of July. I had made reservations to their tea room, which basically is a buffet tea service. This was his first time having "afternoon tea" and going to the Huntington, so he had a great time! Later that night, we had to go to his parents'/grandparents' to toast him, and he told them about the place. We even brought back a lot of scones (see below) for them to try (they did not make it past the evening). I know that we won't always have the opportunity to take time off work and do this kind of stuff on birthdays, but while we can, why not, right?